HONG KONG, Jan 21, 2019 - (ACN Newswire) - Organised by the Hong Kong Trade Development Council (HKTDC), the 29th edition of the HKTDC Education & Careers Expo will run from 24-27 Jan at the Hong Kong Convention and Exhibition Centre (HKCEC). Open to the public with no admission charge, the expo provides comprehensive information on education and job opportunities available in Hong Kong and overseas. Featuring two major zones - the Education Zone and Careers Zone - the four-day fair will host 880 organisations from 22 countries and regions, including educational institutions and consultants, professional associations, government departments, public organisations and private companies. 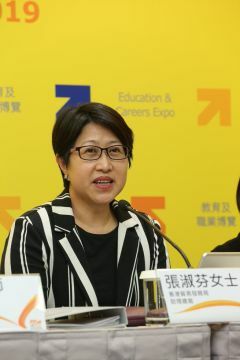 "This year's Education & Careers Expo will see the launch of new education-themed zones, including Creative and Educational Support Services and Tertiary Academy, to clearly define the opportunities available in further education and continuing education," HKTDC Assistant Executive Director Sophia Chong said at a press conference to introduce the expo. "In terms of employment opportunities, the 2019 expo features four career theme days, including three new themes - Culinary Arts, Exploring Construction and Tech & Creativity - as well as the popular Civil and Public Services theme day. We hope to put visitors on the path to success by presenting the latest information on education and employment trends." On the first day of the expo (24 Jan), the Culinary Arts Day, co-organised with the Chinese Culinary Institute and International Culinary Institute, features four interactive workshops, including sugar blossom making and plating, to provide hands-on experience for visitors looking to work in the culinary industry. On the second day (25 Jan), the Exploring Construction Day, co-organised with the Hong Kong Institute of Construction, will invite industry experts to interact with visitors interested in a construction career, while seminars will focus on future developments in the industry. As Hong Kong's innovation and technology sector sees rapid growth, more and more technology enterprises are setting up in Hong Kong and looking to attract fresh graduates. The Tech & Creativity Day (26 Jan), co-organised with the Hong Kong Applied Science and Technology Research Institute (ASTRI), will examine the latest trends and developments in the industry. One of the seminars will explore how augmented reality (AR) can be applied to develop Hong Kong as a smart city, using games such as Pokemon Go and Iron Man as examples. The last day of the expo (27 Jan) will feature the Civil & Public Services Day, with representatives from government departments and the disciplined services, including the Hong Kong Police Force, Hong Kong Fire Services Department, Immigration Department and Correctional Services Department, along with public organisations such as Airport Authority Hong Kong and the West Kowloon Cultural District Authority, introducing different jobs and recruitment details. The 2019 Education & Careers Expo sees the debut of Recruitment Square, which cooperates with recruitment platforms to invite companies such as the Hong Kong Jockey Club, Sa Sa Cosmetic and Sportshouse to provide on-site job recruitment, with some offering on-the-spot interviews. Crystal Jade Culinary Concepts will offer more than 100 job vacancies for positions such as restaurant managers and shop supervisors. Various government departments and public organisations - including the Hong Kong Police Force, Hong Kong Fire Services Department, Immigration Department, Correctional Services Department, West Kowloon Cultural District Authority and Airport Authority Hong Kong - will also conduct on-site job recruitment. More than 2,500 job opportunities will be offered during the expo. The Youth Zone is returning this year with information on internships and job opportunities for young people. Representatives from the Labour Department will introduce various employment opportunities as well its Working Holiday Scheme that allows young people to explore opportunities available overseas. Four new educational zones are set up at the expo this year. The Tertiary Academy zone brings together universities and higher education institutions offering articulation opportunities, including Hong Kong Shue Yan University and the Hang Seng University of Hong Kong. The Vocational and Professional Education zone will feature the Vocational Training Council (VTC), Hong Kong Institute of Construction and Hong Kong Institution of Engineers, introducing a comprehensive range of pre-employment programmes. 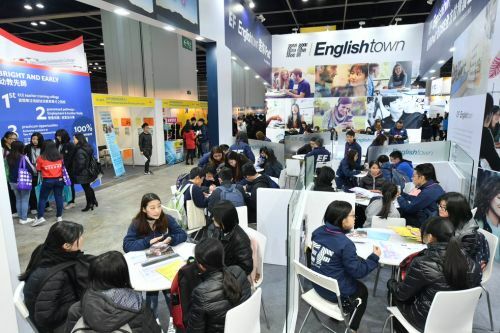 At the Continuing Education zone, Hong Kong language schools EF Language, Wall Street English and the Japanese Language School Affiliated with Tokyo International University will offer value-added programmes. Among the exhibitors in the Creative and Educational Support Services zone is iACL Pacific, which will introduce programmes offered by HASSE Space School. Education theme days will provide an in-depth introduction to studying in the United States (25 Jan) and Europe (26 Jan). Representatives from EducationUSA and the European Union Office to Hong Kong and Macao will host seminars highlighting the prerequisites for admission, application procedures, campus life and more. The International Exchange Village will also return to provide visitors with on-site consultation services for studying and working overseas. Participating Consulate General offices and official education authorities include Austria, the Czech Republic, Hungary, Italy, Japan, Korea, Spain, Sweden and the United States. Entertainment cultural brand Manner creates entertaining videos shared through social media. Actors Hou Dee and Weng Chan will talk about their experience of becoming YouTubers and share some of the challenges of being online celebrities. Sapeiar and BlueGodZi, two novelists famous for their online works, will share how they draw inspiration from daily life at the "A Day in the Life of a Novelist" seminar. Separately, Jayden Lam, a renowned Chinese tutor, will provide tips for passing Hong Kong Diploma of Secondary Education examinations and show ways to use language skills to be more successful in job interviews. The e-sports industry has become a fast-growing trend in recent years. Lo Sing, Team Manager of the Emperor Esports Stars G-Rex PUBG team and e-sports commentator, will share his views on e-sports and discuss ways to enter the industry. Meanwhile, a series of seminars on working holidays will highlight the job opportunities and application requirements in Austria, France, Germany, Japan, Korea and more. Jeffrey Hui, Executive Director of Metro Education Plus, will teach participants how to develop the most effective resume, while workplace consultant Suen Lap-man will examine social skills in the workplace. Established in 1966, the Hong Kong Trade Development Council (HKTDC) is a statutory body dedicated to creating opportunities for Hong Kong's businesses. With 50 offices globally, including 13 on the Chinese mainland, the HKTDC promotes Hong Kong as a platform for doing business with China, Asia and the world. With more than 50 years of experience, the HKTDC organises international exhibitions, conferences and business missions to provide companies, particularly SMEs, with business opportunities on the mainland and in international markets, while providing business insights and information via trade publications, research reports and digital channels including the media room. For more information, please visit: www.hktdc.com/aboutus. Follow us on Google+, Twitter@hktdc, LinkedIn. Sophia Chong, Assistant Executive Director of the HKTDC, says the 2019 HKTDC Education & Careers Expo will feature two major zones - the Education Zone and Careers Zone - along with new education-themed zones and four career theme days. The expo will provide a one-stop platform for visitors to obtain comprehensive information on education and job opportunities. At the press conference to announce the expo, representatives from various organisations give an overview of their services. 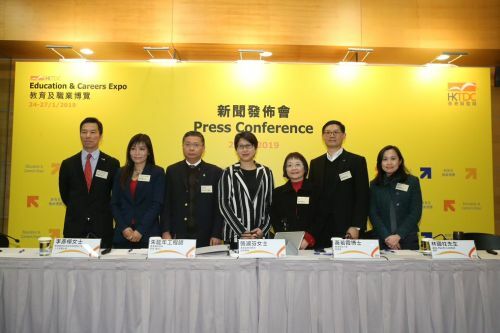 The 29th HKTDC Education & Careers Expo will run from 24-27 Jan at the Hong Kong Convention and Exhibition Centre. The photo shows a scene from last year's event.